Gambini Nut Company has been in operation since 1976 providing top quality walnuts to our worldwide food industry and consumers. Our walnuts are expertly grown and carefully processed into a variety of ready-to-use raw products to suit your needs. Our walnuts are grown with product quality and processing in mind. Gambini walnuts are known for exceptionally high quality nut meats with a thinner, easy-to-open shells which make them perfect for commercial food processing or general consumption. Nature’s goodness, direct from our orchards. Cleaned, processed, laser sorted and packed in 50 lb. or 25 kg. sacks. 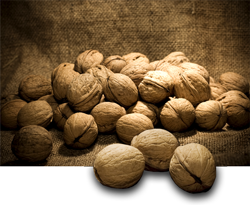 Call Us Today to Discuss your IN-SHELL Walnut Needs!